Does your student need a lunchbox set to bring to school? Or are you looking for a functional and practical gift set to give to a friend? These tableware giftsets make for amazing gifts that you can give to friends or families. If your child needs a lunch bag for school, our Insulated Lunch Bag Set will do just the trick! Complete with an insulated lunch bag, a cute sealed lunch container, a charming pair of training chopsticks, and a pencil and eraser for the classroom, this set is an all-in-one way to prepare your little student for school! When it comes to cute lunch boxes for students, the Japanese Sushi Shop Bento Box Set is perfect for packed lunches with its two compartments, chopsticks, and cool pack. For those who love to have picnics or are always eating meals on the go, our Cherry Blossom Insulated Lunch Tote Bag Set is absolutely perfect for all your needs. 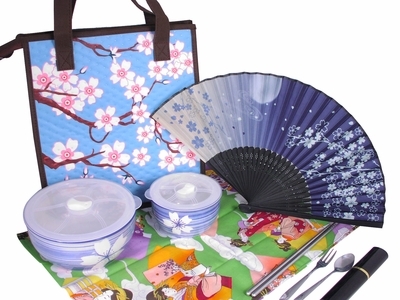 Equipped with an insulated lunch bag, two different sized bowls with lids, travel utensils, a Japanese tenugui towel, and a beautiful handheld fan, this set is perfect for lunches in the summer. Whether you are giving this lunch bag gift set to a student, a friend, or even keeping it for yourself, this lunch set has everything you need for an enjoyable meal in the sun!